Alpacas were domesticated in South America about 6,000 years ago. They are mainly found in Peru, Chile and Bolivia. Are there more than one type? There are two types of alpacas – Huacaya and Suri. Huacayas should have both a dense and crimped fleece which is fine and feels very soft to the touch. Suris fleece hangs from the body in narrow pencil locks (looks like dreadlocks) should be fine, lustrous and have a silky handle – which feels cool to the touch. 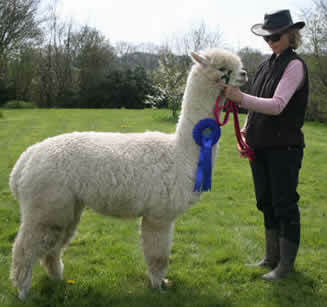 Adult alpacas weigh about 50 to 80 kg and stand about 36'' tall at the withers. Alpacas are extremely hardy, but do need vaccinating and worming. Crias are generally vaccinated at one month old, and wormed at six months – when they are weaned. They graze and browse, and ideally need access to hay all year round. We give ours a feed supplement once a day which gives them a correct balance of minerals and vitamins. How many alpacas can you keep per acre? About 2 to 3 alpacas can be kept per acre depending on the quality of the grass and the time of the year. In certain circumstances a higher stocking density is possible, but obviously it helps to be able to rotate their grazing. Alpacas have a gestation of about 11.5 months. They give birth to a cria which generally weighs about 6 to 9 kg. They tend to be born in day light in the late morning, but are seldom born later than mid-afternoon. They very rarely have twins, but if they do they rarely both survive. The cria is weaned at about 6 months. The females are first bred at about 18 months of age. They are induced ovulators and therefore can be bred at any time. The females are generally re-mated 2 to 6 weeks after the birth. Males become fertile at about 2 to 3 years old. Alpacas benefit from a field shelter to allow them to get out of the rain and the sun but they do not need to be brought in during bad weather and they do not need stabling. Alpacas do not challenge fences and so a 4 foot fence is adequate. Barbed wire should be avoided as should electric fencing. Alpacas are very gentle on the land because their toes have soft pads and therefore do not churn up the ground. They deposit their droppings in middens in only a few sites and therefore cleaning up is easy. No, alpacas are a herd animal and can become very stressed if kept alone even for short periods (such as travelling). They should be kept in groups of at least two. Alpacas can be run with other animals such as goats and sheep. They are sometimes kept with horses, ponies and donkeys, but should be introduced with care. Alpacas are very gentle and easy to handle. They can be halter trained very easily especially when young. They occasionally spit but only when provoked e.g. when being vaccinated. Some will kick when being touched on their back legs but if handled when young, they can be desensitised in this area. Alpacas have only lower teeth at the front of the jaw which meet on a hard upper pad. They don't tend to bite, but sometimes pull at clothing to attract attention! We shear our alpacas once a year - both huacayas and suris. On average a fleece will weigh about 3 to 5kg with top quality stud males having fleece weights at the upper end or even above 5kg. There are 22 fleece colours ranging from white to fawns and browns to black, there are also greys and rose greys and multis. Alpacas make excellent pets. They are intelligent, easily trained and are very gentle with children. They are inquisitive, approaching people who stand and watch them. They will eat out of the hand if time is spent with them, and training to lead by a halter is straightforward (we teach all our alpacas after they are weaned).